This project shows how to use the DHT11 humidity and temperature sensor. The DHT11 is a low-cost digital humidity and temperature sensor. It uses a capacitive humidity sensor and a thermistor to measure the surrounding air and puts out a digital signal on the data pin. The hardware configuration is very simple. All what is needed is the DHT11 sensor and a 4.7k or 10k pull up resistor. VCC and GND are getting connected to the power supply, an IO pin of the microcontroller is connected via the pullup resistor to the data pin. The driver which is getting described here is written in C language for the CCS C Compiler. To use the driver, you just have to include the header file dht11.h in your code. Before the include of the driver, you have to specify which pin of the PIC microcontroller shall be used for DHT11 communication, i.e. which pin is connected to the DHT11 data pin. In the following example it is connected to the pin RC0. Once this is done we can read the raw data via DHT11_ReadData. If the reading was successfull, DHT11_GetHumidity() and GetTemperature() return the humidity and temperature. Here some pictures of my demo setup. 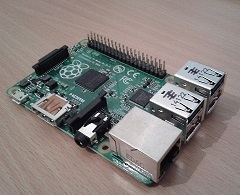 Projects with Raspberry Pi and other devices running Linux.